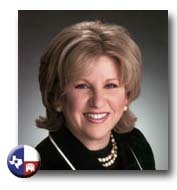 Senator Jane Nelson is a former public school teacher who represents Senate District 12, encompassing parts of Tarrant and Denton counties. She joined the Senate in 1992 after two terms on the State Board of Education in which she led the fight to correct more than 5,000 factual errors in school textbooks. Senator Nelson serves as Chairman of the Health & Human Services Committee and as a member of the Finance, Government Organization, and Nominating committees, as well as Texas Legislative Council. She also serves as Chairman of two interim committees - the Medicaid Reform Legislative Oversight Committee and the Joint Committee on Health & Human Services Eligibility. Last session she never missed a record vote and authored key reforms, including: the state's reform plan for Medicaid and the uninsured; expanded PE and annual fitness assessments in our schools; enhancements to the state's foster care system; the creation of a hospital infection reporting system; stronger protection for seniors and the disabled; curriculum to help young people protect themselves from online predators; and perhaps most notably, Proposition 15 establishing the Cancer Prevention & Research Institute of Texas. She was the only Senator to log a perfect 100% voting record in support of small business, according to the National Federation of Independent Businesses. She was named Champion of Free Enterprise by Texas Association of Business. She received Susan G. Komen for the Cure's first-ever Legislative Champion Award and American Cancer Society's True Grit Award. She and her husband, J. Michael Nelson, own and operate a precision aircraft component manufacturing company in Denton County. They live in Flower Mound, Texas and have five adult children (a son and four daughters) and a grandson.